After months and months of coding, we have finalized the Tezza app, and it is available in the app store! You can now add my presets to your photos on the go! 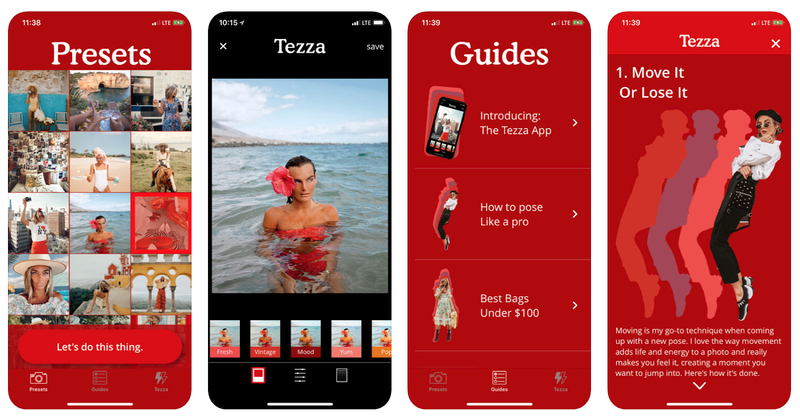 Along with mobile versions of my Lightroom presets and all the photo tweaks you may need, the app also includes exclusive guides to everything Tezza. If you've ever wondered what equipment we use or where our favorite places to shoot in NYC are then search no further and check out the guides we've created to help bring your photography to the next level. We have compiled a little list of some of the questions we answer most often, but be sure to reach out if you are ever lost or have a suggestion, we love to hear from you all! Unfortunately, since my husband Cole specializes in iOS programming, we are currently only able to offer the app to iOS users. Building the app for Android is not a simple process, it would have to be written in an entirely new programming language and rebuilt from the ground up. That being said, we are hoping to find someone to tailor the app for Android users so that everyone can get in on the fun. What images can I edit with the Tezza App? The Tezza App is meant to be used on your iOS device to edit images within your camera roll! Are the presets in the app the same as those sold for Lightroom? There is definitely a difference between the app vs. Lightroom presets, at least as far as power and control go. While the app is great for allowing you to achieve a cohesive aesthetic simply and on the go, you just get so much control and power in Lightroom desktop that you really can’t replicate in any app. So the app may be a good place to start out to get a feel for the presets and the aesthetic, but Lightroom desktop is a very premium and professional solution and is the best way to edit professional photos. How are the subscriptions structured? In-App subscriptions are managed by Apple so to update your preferences all you have to do is go to your phone Settings app at any point and switch which subscription plan you want, then it will automatically switch before it renews next. Here is the path flow for the process: Go to Settings -> iTunes & App Store -> Tap on your Apple ID email -> Tap View Apple ID -> Subscriptions -> Tezza and then there you can update your subscription preferences! What can I expect in the updates? Since our first launch, we have been in contact with you all regarding what you think we need to add or change and we have already begun working on upcoming updates! We will be continuously adding new preset options, uploading new guides, and unlocking exclusive in-app content for you to enjoy. Our last update included 2 new presets, the ability to add scratch dust textures to your photos, preset intensity adjustments, the ability to source from different folders instead of simply the camera roll, as well as bug fixes for smoother functionality. We have so many new ideas that we are constantly working on implementing! The Tezza App provides premium content and, unfortunately, that comes at a (small) cost. While we wish we could offer all of this for free, a TON of work has gone into building the app and presets and we gotta eat!! The Tezza App is constantly growing and evolving and is a fulltime job to maintain and update and build new features. So as you know, my husband, Cole, built the entire app with his bare hands (and computer) and it is our very first app release! We really appreciate you guys standing by our side as we navigate this new launch and can't tell you how much it helps to hear about the bugs or improvement suggestions. We are constantly working on tweaking the app to better suit our vision and yours so keep sharing! Please get in touch if you have any other questions, suggestions, jokes to tell, etc.!!! Looove this app! I need to try it but is it available for android? We are hoping to get it for android soon! Need this for android please! Does it maintain picture quality when editing in the app?